Chances are, if you've ever been to a Japanese or Chinese restaurant, you've probably seen one. Their happy looking eyes. Their little paws that beckon you towards them. That cute mouth that just seems to say "Hey you! Buy some egg rolls!" Yes, I'm talking about Japan's beckoning cat, maneki neko. They're common in restaurants, stores and anywhere else where bringing in people means bringing in the money. But what is the deal with these little felines? Why would you get a cat to welcome people? How come some of them are holding yellow kanji flashcards? And no matter how you look at it, those cats are definitely waving, not beckoning, right? 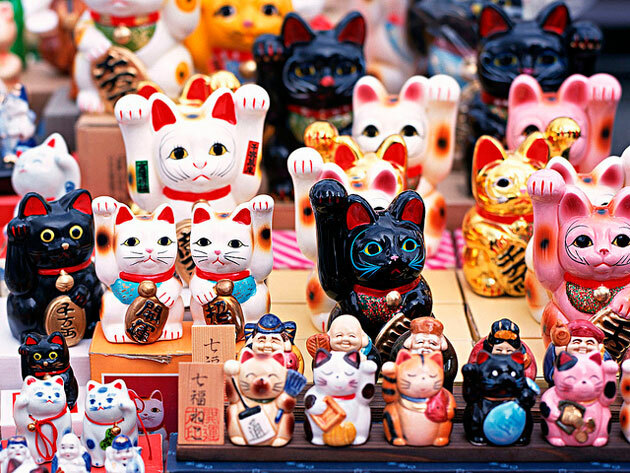 For the answers to these questions and more, we'll begin with the humble origins of the maneki neko. Hang on to your cat; we're traveling back to the Edo era. 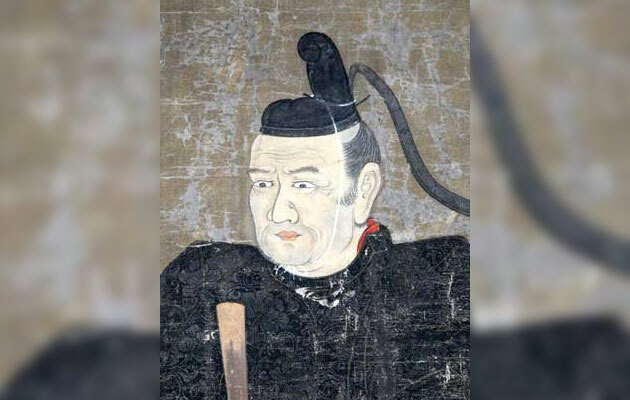 In 1633, a daimyo by the name of Ii Naotaka was out and about, doing the sorts of things daimyos did back then. On his way home, he was caught in a rainstorm and sought shelter under a tree. Nearby was an old, rundown shrine, whose owner had a pet cat. Naotaka noticed the cat beckoning him over to the shrine. He figured whatever a cat had to tell him was important enough to risk getting a little wet, and hurried on over to the temple. Then, as if on cue, Naotaka's former shelter of a tree exploded into a twisted mess of splinters and post-lightning fire. Shocked that the cat had just saved him from getting a much larger shocking, Naotaka decided to return the favor, making sure the temple, and its beckoning cat, never had to worry about money again. The temple was renamed Gotokuji Temple after Naotaka's posthumous Buddhist name, and is, to this day, filled with beckoning cat statues. 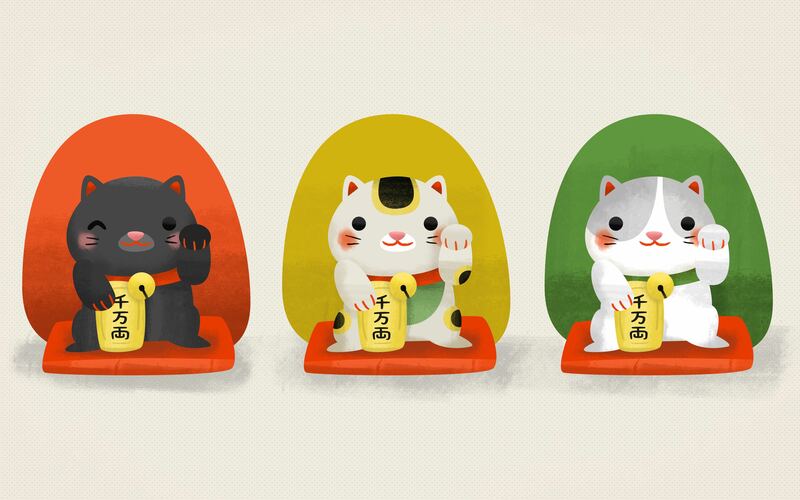 The tradition of maneki neko was born. Another legend tells of a cat loving geisha by the name of Usugumo. One night, her beloved pet cat began to pull at her clothes. Usugumo tried and failed to get the cat to stop and, not wanting it to claw up her fancy kimono, called for help. The owner of the establishment misunderstood, and thought that the cat was possessed. He pulled out his sword and quickly cut off the head of the cat. The cat's head went flying through the air and, in one last act of loyalty, bit and killed a snake about to attack Usugumo. Realizing that the cat was trying to warn her about the snake, Usugumo became depressed over the loss of her pint sized protector. To cheer her up, a customer created a wooden statue of her cat, with a paw raised in warning. And the tradition of maneki neko was born. Again. A third legend tells of an old woman and her pet cat. The old woman was very poor and, without any daimyos around to save from lightning, was forced to sell her cat. The cat later comes to her in a dream and instructs her to create a clay model of it. The old woman follows the cat's slightly egotistical advice, and finds that someone wants to buy it. She creates more statues, which become extremely popular, turning her cats into cash. And, for the third time this article, the tradition of maneki neko was born. Yes, But What Is The Meaning Behind Maneki Neko? But wait, a cat with its paw up doesn't look like its beckoning, right? Well, that depends where you live. In Japan, the gesture is reversed, with the fingers downward (as demonstrated by Koichi in this video). 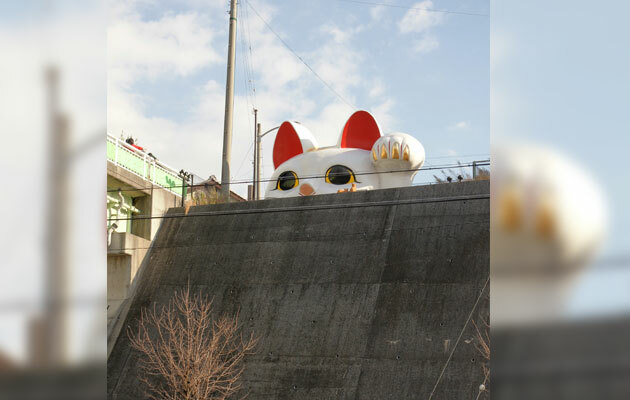 There are also westernized maneki neko with the paw facing the opposite direction, mimicking the western style of beckoning. These beckoning cats are sometimes depicted with coins with dollar signs on them, earning them the name "dollar cats." Of course, if western lucky cats are holding western money, it only makes sense that the classic version of the east are holding classic money of the east. Many Japanese lukcy cats are seen holding a ryo, an old form of currency from the Edo era that was worth quite a bit of money. Additionally, many of the ryo that they hold are labeled senmanryou 千万両（せんまんりょう）, meaning "ten million ryo". Then again, since senban 千万（せんばん） can also mean "a great many", it's possible that these maneki neko simply cannot count particularly high. 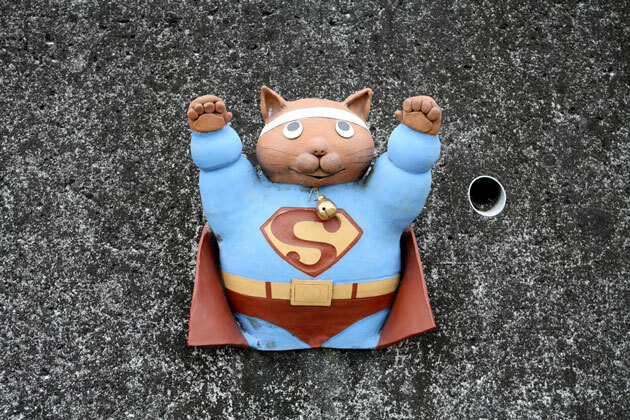 The maneki neko is said to be beckoning for different things, depending on which paw it's using. 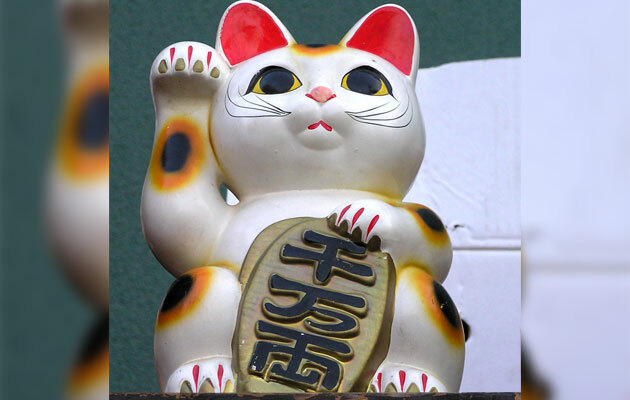 A lucky cat with its left paw up is inviting people, while one with its right paw is inviting money. Although, if you're a shopkeeper, you probably want people to come to your store and buy things, so you may want one of each. Or, better yet, one with both paws raised. Now, if something as little as which paw is up has meaning, it's reasonable to expect color to play a big part, too. Yes, just like how the color of candy tells you its flavor, the color of a beckoning cat tells you what that cat's talent is. The classic calico design is the most popular, and brings its owner fortune. Likewise, an all-white cat is also for luck. A black maneki neko is useful for warding off disease and evil. A gold one performs as you may expect, and brings in the money. A red one is used for both protection from disease and demons, and bringing its owner good health. Pink is used for inviting love. There are other various colors, such as yellow or green, that are sometimes linked to feng shui. So, have you had any experiences with maneki neko? Have you seen any strange or rare ones? Do you own a lucky cat? Personally, I have a little one that sits by my computer. It doesn't bring luck or money or anything, but I've never been attacked by any snakes while it's around, and that's gotta count for something.